Veteran Turkish journalist Hasan Cemal testified to prosecutors in Istanbul on charges of insulting Turkish President Recep Tayyip Erdoğan in an article he penned in July, T24 news site reported on Thursday. Cemal, who is a columnist of T24, said that he had practiced his freedom of expression in his article titled “Dictatorship, Dictator”. “If this article is being criminalised in a country, then this means there is no freedom of expression in this country. It means there is no rule of law in this country. And it means there is no democracy in this country,” Cemal said after testifying. The prosecutors reportedly asked Cemal his links to Gülen movement, a religious group the Turkish government blames for orchestrating a coup attempt in 2016. 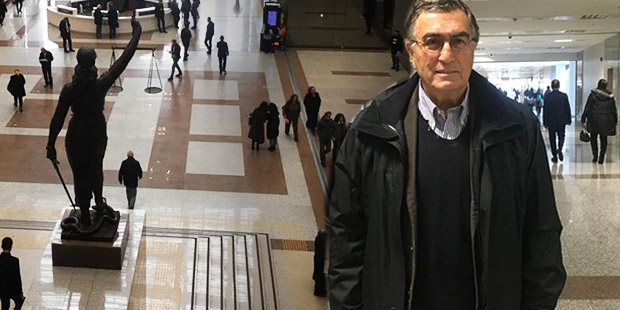 Cemal is accused of using words like “single man rule”, “dictator”, and “civilian coup” that the prosecutors said had also been used before the coup attempt by a whistleblower of the movement known as Fuat Avni. Turkish pro-government newspaper Yeni Akit targeted Cemal on Thursday saying that there was an arrest warrant for the journalist and he had fled abroad to avoid entering jail whereas Cemal at the Courthouse in Istanbul today testifying. Cemal is also the founding president of the Platform for Independent Journalism (P24), an initiative established to support and promote editorial independence in the Turkish press. P24 follows trials of all journalists prosecuted in Turkey over terror related charges and provides regular reports. Yeni Akit said that 80 percent of the funds used by the platform had been provided by Western countries. A German consulting firm, the U.S. non-profit organisation National Endowment for Democracy, Norwegian Embassy and Swedish Consulate in Turkey, and the Guardian Foundation have supported P24, Yeni Akit said. The newspaper called the West “the centre of terror and chaos” and said that countries in the West had been providing shelter to Turkish journalists that support terrorism. “You will answer at court for your ignominious slanders and horrible lies about me. I am not a fugitive,” Cemal said on Thursday on Twitter in response to Yeni Akit. Cemal also announced that he would give a break to his columns in T24 for a while in order to rest his head. "Yazımı bugün de özgürlük ve hukuk adına savunuyorum"